P.I. 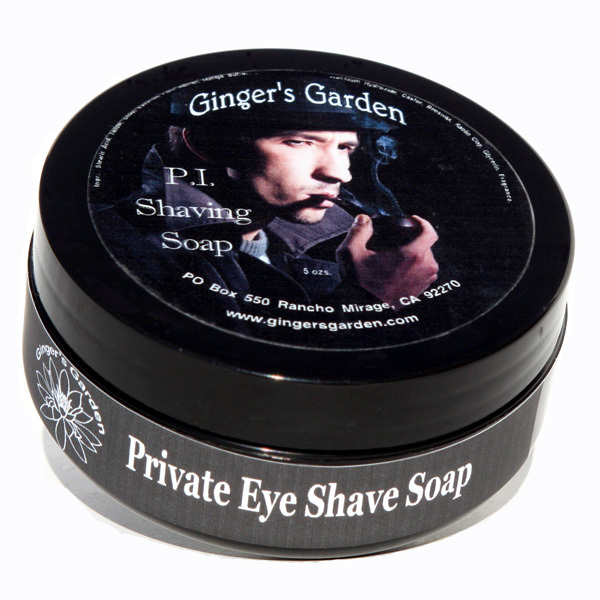 Private Eye Shaving Soap has masculine blend of mandarin, bergamot; lavender, coriander, cedarwood and patchouli. Get a better, smoother, slick shave with this soap. P.I. Private Eye Shaving Soap has masculine blend of mandarin, bergamot; lavender, coriander, cedarwood and patchouli. Get a better, smoother, slick shave with this soap. Use with a brush directly on the face or lathered in a shaving bowl or a scuttle. This formula easily creates lots of thick, protective lather with plenty of lather for 3 passes. I make this shaving soap as a small batch to assure you of quality. It is made with mango butter for its wonderful properties in wet shaving. Private Eye shave soap produces luxurious leather with a layer of cushion, slickness and smooth glide. This is a thirsty soap, so don’t be afraid to use more water. Ginger’s Garden shaving soaps are made by hand in Palm Springs, California. They are cured for 4-6 weeks to make sure that the soap is mild. P.I. Private Eye Shaving Soap comes in a handsome, black reusable jar and can be used in either hard or soft water. I'm trying out new side labels for those of you that stack your shaving soaps. Ingredients: Stearic Acid, Tallow, Olive, Coconut, Palm Kernel, Mango Butter, Sodium Hydroxide, Potassium Hydroxide, Castor, Beeswax, Kaolin Clay, Glycerin, Fragrance and Essential Oils Blend.